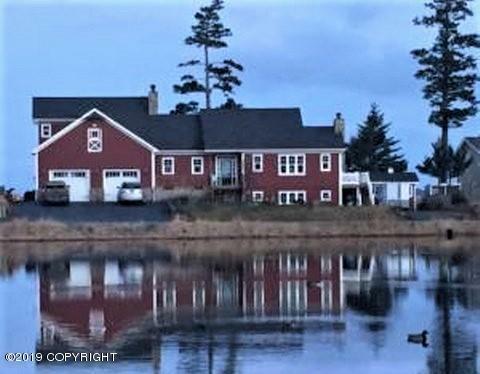 3944 Spruce Cape Road, Kodiak, AK.| MLS# 19-1284 | RE/MAX of Kodiak - Alaska Real Estate - "Honesty & Integrity...It's That Simple!" Stylish, modern & airy describe this rambling, custom-built oceanfront home in the highly sought-after Spruce Cape Subdivision. Imagine yourself waking up to the sight and sound of the ocean waves and beautiful Kodiak sunrise! Sprawling breakfast bar, gas cooking, granite counter tops, stainless steel appliances and walk-in pantry make this kitchen a gourmet chef's dream. The layout and finish features of this builder's private home allow for ease of entertaining and large family gatherings. Nearly every room has its own unobstructed view of the ocean and/or view of the neighborhood pond. It's easy to forget there are neighbors on either side because of the way this home's layout was thoughtfully arranged. The deck is located right outside the kitchen and, with stainless steel cabling, the ocean view is maximized while you relax in your deck chair. Across the street and encircled by a walking trail is the neighborhood pond, where kids of all ages enjoy winter ice skating and hockey as well as summertime kayaking, and year-round bird watching. Storage is abundant here with multiple crawlspace storage areas plus a matching, custom-built shed to the right of the home with a separate driveway where guests may park and quietly enter the lower level living space, should you decide to run a B & B! This home is energy efficient, rated 5-star plus, with an oil-sipping Oil Miser that warms the radiant in-floor heating system along with two fireplaces to provide cozy ambiance on cold winter nights and rainy days. Upgraded triple-pane windows keep the home snug while the ventilation system controls moisture and cooking aromas. The cedar shake siding was manufacturer hand-dipped in red stain which, along with the bold white trim, gives the home its coastal appeal. You will find that the smallest details have not been overlooked in this beautiful home. Don't delay! Call your REALTOR today for more information!